Your pup is more than just a pet; he’s a member of your family. That’s why, as a pet parent, you go above and beyond to ensure that you are providing him with the best care possible to ensure that all of his needs are being met. Like any responsible pet owner, you’ve probably put a lot of thought and research into making sure that you select the best quality products for him. His dog crate offers just the right amount of room, he has a comfortable and supportive dog bed, you bathe him with a top-rated dog shampoo, and you take him for regular walks on a well-fitted dog harness. But of all the products that you offer your canine companion, there’s one that’s more important than all the rest: his dog food. Like humans, canines require a well-balanced diet that contains high quality ingredients to ensure that his unique nutritional needs are being met. But with so many different dog food brands and formulas on the market, it can be hard to decide which option really is the best and will properly nourish your four-legged family member. Some of the options include Blue Buffalo dog food, Taste of the Wild dog food, Wellness dog food, and Merrick dog food. While these are all very reputable brands that contain the highest quality ingredients, they also tend to have high price tags. For pet owners who are looking to spend a little less on dog chow, but don’t want to sacrifice quality, there’s Nature’s Recipe dog food is a great option to choose. Is Nature’s Recipe a good dog food? Why should you consider feeding your furry pal this food? In this review, we’ll answer these questions; but first, we’d like to present our top five picks for the best Nature Recipe dog food. Now that you have had a sneak peek at our top choices, let’s examine each one a little bit closer. 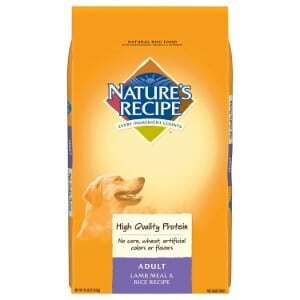 Below, we provide a more detailed Nature’s Recipe dog food review for each formula. In each review, we discuss the ingredients that are found in each recipe, why we consider them the best, and what other pet owners who have fed these formulas to their dogs’ have had to say. After you finished reading through the reviews and decide which one you think will best meet the needs of your furry pal, click on the buttons to find the best prices currently available on Chewy and Amazon. 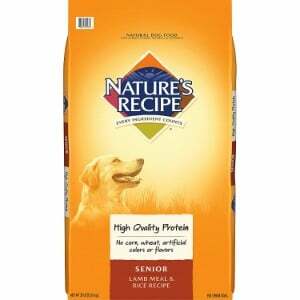 First up on our list of the best Nature’s Recipe dog food formulas is their Adult Dry Dog Food. Whether you are looking for a food for small dogs, like a toy Poodle or a Yorkshire Terrier, or a food for large dogs, such as a Cane Corso or a Newfoundland, this recipe will offer your adult pooch the nourishment that he needs to maintain proper health. This formula features protein-rich lamb meal as the first ingredient, which will offer your furry friend the nutrients he needs to sustain his lean muscle mass and keep his joints healthy. Instead of corn and wheat, rice, oatmeal, and barley are the sources of carbohydrates in this food. They will fuel your pooch’s energy and are easy for him to digest, so this recipe can certainly be considered a dog food for sensitive stomachs. It’s also fortified with essential vitamins and minerals, like biotin, vitamin B12, zinc, vitamin A, calcium, zinc, taurine, and potassium, so you can have confidence knowing that your pet will be getting the nutrition that he needs to support his overall health and well being. The kibble is moderately sized, making it easy for small and large mouths to handle, and because it’s crunchy, it will help to remove plaque and tartar buildup to keep your dog’s teeth clean and his breath smelling fresh. According to the Nature’s Recipe dog food reviews that we read, pet parents said that even their picky eaters love the flavor. They also stated that this recipe was recommended to them by their veterinarians. Final Verdict: For pet parents that are looking for a high quality, affordable dry dog food for their adult pooches, Nature’s Recipe Adult Dry Dog Food is a great choice. Packed with vitamins, minerals, and nutrients, like protein and amino acids, it will keep your adult pooch happy and healthy. And at under $30 for a 30-pound bag, it’s very budget-friendly. Whether your pup is sensitive to gluten-based products like corn and wheat, or you just don’t want to feed him these ingredients, you might want to consider feeding him Nature’s Recipe Grain Free Dry Dog Food. It features sweet potatoes and pumpkins, which are easy to digest carbohydrates, and contains absolutely no corn, soy, or wheat, making it a completely grain free dog food. It’s also formulated for dogs of all sizes and of all ages, so whether you have a puppy, an adolescent, or a mature dog, a small or a large breed – or you have multiple pups of varying breeds and ages – this recipe will cover everyone. In addition to being grain free, this recipe also contains plenty of other nutritious ingredients. Real animal protein, which is sourced from chicken, is the first ingredient, so it offers plenty of protein to maintain lean muscle mass to keep the joints healthy. Other wholesome ingredients include potatoes, peas, apples, and tomatoes, which offer tons of healthy nutrients, but also give this food a flavor that most dogs will find palatable. To further enhance the nutritional content, Nature’s Recipe infused their grain free formula with essential vitamins and minerals, vitamin E to support the health of your dog’s skin and make his coat fuller and shiner, calcium to support his bones, and vitamin C to strengthen his immune system. Final Verdict: For canines of all breeds, sizes, and ages that require a grain free diet, Nature’s Recipe Grain Free Dry Dog Food will ensure that their nutritional needs are met. Featuring grain free, easily digestible carbohydrates, protein-rich chicken, and a bevy of fruits and vegetables, this formula will provide your pooch with a well-balanced diet. Puppies have different dietary needs than adult and mature dogs. In order to ensure that your little guy (even if he is a large breed) is getting the right nutrition to support his growth and development, feeding him a dog food that has been properly formulated to offer the right balance of vitamins, minerals, and nutrients that puppies need to flourish is essential. 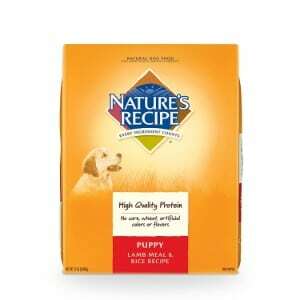 Nature’s Recipe Dry Puppy Food is made for all breeds of growing puppies. The first ingredient is lamb meal, which is protein rich and will properly support those growing muscles, but it’s also easy to digest, so it will be gentle on your puppy’s delicate tummy. This recipe has plenty of premium quality carbohydrates, like pearled barley, oatmeal, and ground rice, to fuel your puppy’s high energy levels. This food is also infused with essential supplemental vitamins and minerals that are vital for proper growth and development, like vitamin D3, folic acid, biotin, vitamin B12, zinc, calcium, vitamin E, niacin, and thiamine. The smaller sized kibble is easy for tiny mouths to handle and will help to support the development of healthy teeth, as it removes tartar buildup with each bite. Final Verdict: To make sure that your puppy is getting the nutrition that he needs to thrive at an affordable price, consider feeding him Nature’s Recipe Dry Puppy Food. Packed with protein, carbohydrates, and vitamins and minerals that are essential for growth and development, this recipe is nutritious and delicious. Like puppies, mature canines have unique dietary needs. As a dog ages, the amount of calories, carbohydrates, and protein that he needs changes. That’s why it’s important to feed your older pooch a specially formulated senior dog food. Nature’s Recipe Senior Lamb Meal and Rice Recipe Dry Dog Food will help to maintain the overall health and well being of your four-legged friend; and keep him excited about mealtime, too! This recipe features protein-dense lamb meal as the first ingredient. Protein is important for dogs of all ages, but particularly seniors. It’s the building block of lean muscle mass and helps to maintain joint health, thereby preventing the development of issues like hip dysplasia that can reduce a dog’s mobility. And, since lamb meal is easy to digest, it won’t upset your senior dog’s delicate digestive tract. To help maintain an active lifestyle, this formula features rice, ground whole wheat, and rolled oats; natural carbohydrates that will fuel him with energy. It’s also infused with vitamins and minerals that are important for the health of a senior dog, like vitamin K, folic acid, biotin, vitamin E, iron, and vitamin A. The crunchy kibble will also help to support his oral health, as it removes plaque and tartar buildup with every bite. Final Verdict: Nature’s Recipe Senior Lamb Meal and Rice Recipe Dry Dog Food offers the balanced nutrition that senior dogs need to maintain their health. It’s infused with essential nutrients and contains premium quality ingredients. It also offers a delicious flavor that most canines seem to enjoy. If your dog is a picky eater or he has a hard time eating dry kibble as a result of dental health problems, you might want to consider feeding him a high quality wet dog food instead of dry food. Wet food has a texture and flavor that is more similar to the food that the ancestors of domesticated canines ate, so many dogs find it more palatable. Plus, the tender morsels are much easier to chew, so it’s a lot easier for pups with oral health issues to chew. Nature’s Recipe Wet Dog Food contains wholesome, grain free goodness that will keep your pet healthy and satisfied. 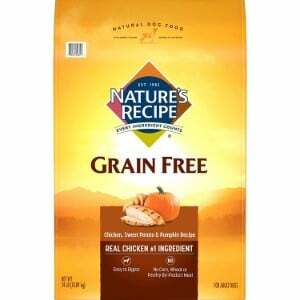 This wet food formula from Nature’s Recipe features premium sources of protein, including chicken and duck. These ingredients not only help to support lean muscle mass and promote better joint health, but also offer a flavor that pet parents say their dogs love. Pumpkin is a grain free carbohydrate that contains tons of nutrients and is easy to digest, so it will nourish your pooch and help to improve his digestive health. All ingredients are combined in chicken broth for added protein, tenderness, and even more flavor. It’s also infused with vital vitamins and minerals, such as vitamin A, vitamin D3, calcium, vitamin B12, zinc, copper, and magnesium. According to the Nature’s Recipes reviews, most dogs and their parents are very happy with this product. Final Verdict: If you are looking for a healthy wet dog food that your pet will gobble up, Nature’s Recipe Wet Dog Food is a fantastic option. This grain free formula is packed with protein and offers nutrient dense ingredients, as well as supplements, to ensure your pooch receives well-balanced nutrition. Whether you have had dogs your entire life or you have just welcomed a furry friend into your family, there’s no doubt that you are aware that there are literally dozens of dog food brands on the market to choose from. Unfortunately, however, not all brands are the same. In fact, some contain subpar ingredients that offer little to no nutritional value. Even worse, some ingredients found in dog food can actually have adverse effects on your pet’s health. Of course, you want to ensure that you are offering your furry friend food that is made of quality ingredients and offers the nutritional content that he needs to thrive. While there are plenty of high quality dog food manufacturers, but many of them also have high price tags. But if you don’t want to break the bank or sacrifice nutritional value, then you might want to consider Nature’s Recipe dog food. If you have never used Nature’s Recipe dog food before, in this section of our review, we’ll shed some light on this manufacturer so you can determine if it’s the right choice for your furry pal. Nature’s Recipe has been feeding canines’ high quality dog food for more than 35 years. They create a variety of formulas for dogs of all ages, sizes, and breeds; all of which feature ingredients that have been carefully chosen to ensure optimal health. All of the ingredients have a purpose; in other words, they are selected because they serve a specific need. For instance, real meat, chicken, or fish are chosen as rich sources of protein to help build and maintain lean muscle mass and support joint health. Fresh vegetables contain essential nutrients, are easy to digest, and add delightful flavor that dogs’ love. Natural sources of carbohydrates fuel energy to ensure pups’ maintain a healthy, active lifestyle. With so many different brands of dog food out there, why should you choose Nature’s Recipe? Firstly, their reputation speaks for itself: pet parents have been entrusting this brand for more than 35 years to nourish their dogs’. Since they offer so many different recipes that are formulated for dogs of all ages and sizes, you can be sure that you will find an option that will meet your furry friend’s nutritional needs. Of course, as you would expect from a high quality dog food, the ingredients featured in all of the recipes made by Nature’s Recipe are of excellent quality, which ensures the health and safety of your pooch. But what really sets Nature’s Recipe dog food apart from other brands of dog food is the cost. While their formulas are high quality and are made to meet dietary needs, they are very affordable. That’s because this manufacturer prides itself on offering exceptional quality for optimal animal health, but at a prices that won’t put pet parents out. 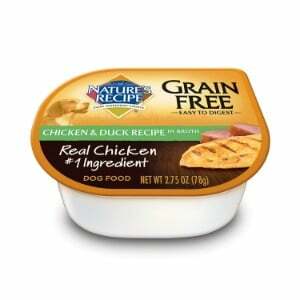 For instance, the ingredients found in Nature’s Recipe Grain Free Dry Dog Food are very similar to the ingredients that are used in Blue Buffalo Grain Free Dry Dog Food, but at a fraction of the cost. As we mentioned, Nature’s Recipe makes a variety of formulas. So, how did we decide which options were the best? We asked veterinarians, animal nutritionists, and pet food scientists if they would help us assess the ingredients in this brand of pet food. We also looked at the countless Nature’s Recipe dog food reviews. Based on the information that our panel of experts provided, and what we discovered as we read through the reviews, we were able to narrow down the options to five. In our review, we offer formulas for adult, puppy, and senior dogs, as well as those who might have food sensitivities, allergies, or delicate digestive systems. If you are on the market for a high quality, highly reputable, affordable dog food for your pooch, Nature’s Recipe is an excellent option. Made with quality ingredients and formulated for the unique dietary needs of dogs of all ages, sizes, and breeds, you can be sure that your pet will get the well-balanced nutrition that he needs to thrive.